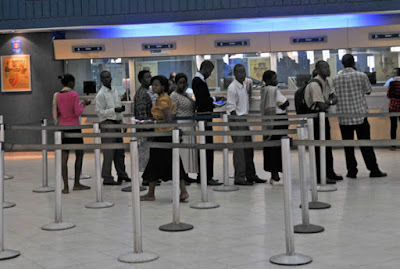 A stamp duty of N50.00 on all bank customers on any money received into their accounts has been enforced by the Federal Government of Nigeria. This means that every bank customer will be charged N50.00 for stamp duty on any money received in their account electronically either by transfer, cheque or cash as part of efforts to advance Nigerian revenue structure which opportunities are being looked at in the non-oil sectors especially taxes and rates. This was contained in a Circular addressed to all Deposit Money Banks captioned "Collection and Remittance of Statutory charges on receipts of Nigeria Postal Service under the Stamp Duties Act"
“As part of efforts to boost its revenue base, the federal government of Nigeria is exploring revenue opportunities in the non-oil sectors especially taxes and rates. It is in recognition of this fact that banks and other financial institutions are enjoined to support government’s revenue drive through compliance with the provisions of the Stamp Duties Act, LFN 2004 as reinforced by the court judgement in Suit No FHC/L/CS/1710/2013. In this regard, the CBN pursuant to the provisions of its enabling laws, hereby issues this circular to all DMBs other financial institutions: With immediate effect, all DMBs and other financial institutions shall commence the charging of N50 per eligible transaction in accordance with the provisions of the Stamp Duties Act and Federal Government Financial Regulations 2009, that is, all receipts given by any bank or other financial institution in acknowledgment of services rendered in respect of electronic transfer and teller deposits from N1, 000 and above; For all avoidance of doubt the following receipts are however exempted from imposition of stamp duties: payments of deposits or transfer by self to self whether inter or intra bank; and any form of withdrawals/transfers from saving accounts; It should be noted that these charges are only payable by receiving accounts; Each DMB shall open an account designated as NIPOST Stamp Duties Account into which all charges collected shall be paid. The balances in such accounts shall be transferred monthly by the DMBs to CBN NIPOST Stamp Duty Collection Account No. 3000047517; Other financial institutions shall remit their Stamp Duty collections to any DMB of their choice”.